I'm super picky when it comes to men and even pickier when it comes to brows. Being a single NYer who pays particular attention to grooming (yes, even at happy hour after a few Michelob Ultras), I'm having a serious issue with men and their brows. For me, finding the right balance in a guy is like finding a guy with brows that are done just right.... well, almost. In New York, it seems they're slickly waxed to perfection (better than mine), not maintained at all, way too bushy, ones that are begging to be trimmed and I've even caught glimpses of a few uni-brows wandering the subways. Maybe it's because most of my friends would say I tend to be attracted to "guidos." Don't even get me started on their brow situation, but they're not the only ones with the problem. 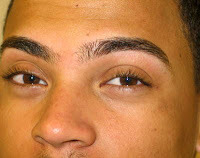 Have you ever been turned on or OFF by a man's brows?